The precious oil produced by a Palestinian olive tree has been referred to as the most political food in the world (BBC). Thousands of Palestinian families’ livelihoods are supported by the many commodities that the olive tree bears. Olives, olive oil, and olive wood are threatened by the destruction of Palestinian olive trees by the Israeli occupation. For many Palestinian olive farmers, the trees have been in their families for generations. The lifespan of an olive tree can potentially be up to 2,000 years, and has great cultural significance. Historically a symbol of peace, the olive branch is often pictured in mouth of the dove. 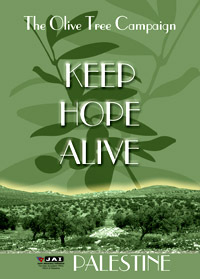 The importance of olives and olive trees to the Palestinian people cannot be stressed enough. Besides being the main source of income for over 800,000 Palestinian families, its rich historical significance and difficulty to cultivate make it a main target for Zionist settler groups, as well as militarized Israeli police (Shiraz). In addition to choking out the water, militarized Israeli forces have been uprooting the olive trees of many Palestine olive growers around the ever-expanding boundaries of Israel. In a case study conducted by JAI Palestine, three olive workers spoke out about the destruction of their trees and the seizure of their lands (JAI). The conflict between Israel and Palestine is broader and more complex than the destruction of olive trees, despite their significance. The destruction of olive trees, mostly by so called “extreme Israeli colonists” is one expression of the extreme tensions which exist (IMEMC News). The destruction of olive trees as a method of land acquisition from Palestinian farmers is the primarily focus of this study. Despite this, some backstory on the conflict is essential to understanding why these trees are being uprooted. The conflict is complex, but not dissimilar to other stories of land acquisition. Discrimination against Jewish people was widespread across Europe for centuries prior to the Holocaust. One anti-Semitic criticism of Jewish people was that they were rootless and landless. This was often used as a justification for the dehumanization and prejudice many Jewish people had faced. Although the Jewish people had never had a homeland, since the earliest Jewish diaspora, Zionist Jews have made an effort to return to the area that is now considered Israel. The religious importance of the area in Judaism is what makes the area holy to Jewish People. As this area is sacred to many religious groups, Christians and Muslims consider the area holy as well. Palestinian people had lived in the area that is now recognized as Israel with the Jewish and other populations that also lived in the area. Since its official creation in 1897 by Theodor Herzl the Zionist political movement has worked to create, defend and expand a Jewish state. The Zionist movement, came from a term coined in 1890 by Nathan Birnbaum. Zionism has worked to unify “Jews of all persuasions – left, right, religious and secular – who formed the Zionist movement and worked together toward its goals” (Jewish Virtual Library). The British mandate of 1923 divided the area into two administrative districts, Jordan and Palestine. In 1949, Israel was officially admitted as a member of the United Nations. In the decade after the declaration of Israel’s statehood, the population of Jewish people migrating from other parts of the world continued to swell. By 1958, the population of Israel had increased to two million. By 1970, approximately 1,150,000 Jewish refugees had relocated to Israel. Frequent attacks and conflicts between Israelis and Palestinians continued throughout the 1950s and ’60s. In 1967, the Six- Day War ended with Israelis claiming the West Bank from Jordan, the Golden Heights from Syria, and the Gaza Strip from Egypt. This enlarged the boundaries Israeli-occupied territories and created the Green Line, which marked the administrative boundary between Israel and the occupied territories. Today, a main goal of the Zionist parties is to “protect” the Jewish State, this protection has been violent, and militarized. Zionist groups have been the perpetrators of many attacks on olive trees. 1967 was the first year that violently uprooting olive trees was used as an Israeli method of land acquisition. Since 1967, 800,000 olive trees have been uprooted (Shiraz). After the Palestinian intifadas (uprisings) of the 1990s and 2000s Israel constructed a large wall which encircles the borders of Israel. 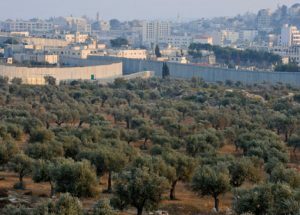 This wall goes through Palestinian olive orchards which were planted long before Israel’s statehood. Because most of the orchards belong to Palestinian families, the trees were simply destroyed as a means of choking out Palestine economic activity, in the name of “security.” Militarized Israeli forces are claiming more and more land violently from Palestinian farmers, and olive trees are on the front lines of this attack. As the acres of Palestinian land are taken, the incidents of violence increase and more olive trees are destroyed. Olive oil is the second largest export from Palestine, it makes up 25% of the agricultural production coming out of the West Bank. Organizations such as Sindyanna and Canaan work to unify olive workers, and sell their oil and other products at fair-trade prices. In addition to olives, olive oil and olive wood, olives are used to produce products such as oil soap, table olives and pickles. Solidarity between the workers who produce these products can lead to resistance against labor exploitation and the destruction of olive trees. For many olive farmers, exploitation is not as big of a concern as the destruction of their olive trees by occupation authorities and Zionist settlers. The attacks on Palestinian agriculture are hurting both farmers and costing the Palestinian economy millions. Destroying the trees is a tactic meant to choke out Palestinians economically as a means of acquiring land. It is important to note that continuous actions to prevent the loss of the Palestinian olive market are being made. Despite continuous raids by the Israeli forces, Palestinians and allies plant around 10,000 new olive trees every year (Olive Tree Campaign) . Along with helping to plant olive trees, allies with organizations such as the Olive Tree Campaign help to provide a “protective presence” to olive workers as they work to cultivate their trees. This is especially helpful because during the time which farmers are working to cultivate their olive trees they can be under threat from Israeli forces and settlers. Many families work together in their olive orchards, in part to make the work easier, and also to pass down the knowledge of cultivation. This hands-on education cannot happen in the fields when there are militarized vehicles threatening Palestinian families (Stuart). Farmers who have had their trees wiped out by Israeli forces can be completely devastated. It can take up to 20 years for an olive tree to grow back, and can take many more than 20 years before the tree may begin bearing fruit. About 100,000 Palestinian families main source of income comes from the olives they grow. The Uprooted is a short documentary released in 2012 by JAI Palestine (JAI). It tells the stories of two farmers whose lands and livelihoods were taken by Israeli forces. Their land was taken under the 15 Israeli land seizure orders which were enacted between 2002 and 2011. These orders took land from nearly every family in and around Jab’a, a Palestinian village located in the northern West Bank, 8 kilometers southwest of Jenin. Map of Jab’a and the surrounding area. The description of the film highlights the devastation that many Palestinians are facing under Israeli occupation, “As the farmers are forced to witness the expansion of the Israeli settlements on their own lands while they and their community are pushed out of the ever-shrinking area of their historic birthplace” (JAI). Abu Firas is a Palestinian olive farmer and landowner in Jab’a. In the documentary he states, “the land is my life, it is the principle that I live by, our whole livelihood is based in our land. Without it, we have no existence” (JAI). In an attack against his village in 2005, Firas lost 170 olive trees and 110 dunums (about 27 acres) of land from the village. In total, 650 trees were destroyed in the attack. In the place of the trees that were destroyed, a massive “official crossing terminal” which prevents the farmers from crossing their lands was constructed. The terminal prevents farmers access to cultivate the olive trees that remain on what is now the Israeli side of the terminal. The trees that remain produce rich olives because they were cultivated by Palestinian families for hundreds of years. It takes many years for a tree to produce the richest olives that can be used for oil. Abu Taha is also an olive farmer from Jab’a who was interviewed for the project. He explains how, in order for Israeli settlements to be built, Palestinian villages have been destroyed and families are displaced. Along with the villages, the olive trees are burned. Israeli use of land is very corrupt, as Taha explains. Near his village there is a massive expanse of empty land behind the Israeli settlement that was built over Palestinian villages. This land was defined by the Green Line and was detached from Palestine in 1948, Taha explains. However, despite this empty land, the land that Taha’s village once stood was taken in order to build an Israeli settlement. That day, Abu Taha lost 150 olive trees. Taha and Firas are only two farmers from Jab’a who have come forward to tell their stories. Jab’a has been subjected to numerous and continuous attempts on the part of the Israeli authorities with the support of the Jewish National Fund to confiscate their land. In addition to land confiscation and the destruction of hundreds of families’ livelihoods, Taha tells of Israeli officials coming into Jab’a when he was a young man and deceiving the elders there into giving them their land. Another issue which is brought up in the documentary is the Israeli construction of water pipelines through Palestinian lands. These pipelines are destructive to the land they are built on. The Israeli government also works to constrict Palestinians’ water use (see table). In addition to harming the people who rely on that water, Israeli water construction is another method of choking out Palestinian agriculture (Corradin). 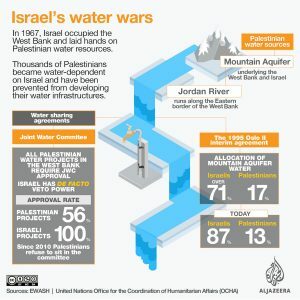 ‘ Table illustrating the Israeli restriction of water to Palestine. The destruction of the olive trees, and the danger that young children are put in by visiting the olive orchards, is one reason why young Palestinians are moving away from farming as a career. An elder olive farmer who participated in the documentary (but is unnamed) states that because of the threat that the militarized Israeli forces impose at the olive orchards, he no longer brings his children to work with him. This state of affairs is sad for two reasons. First he cannot effectively farm without the help of his children which causes the quality of his olives to decline. Second, his children are unable to learn the skill of olive cultivation and the livelihood is not passed down through the generations. This is detrimental to the future of the Palestinian nation and its olive market. The dilemma is the length of time it takes to cultivate an olive for oil production and edibility. In the 20+ years it takes to cultivate an olive tree to produce fruitful trees, the knowledge of how to do so could be lost in a generation. The other way this knowledge is lost is through the human lives taken in the continued violence between militarized Israeli forces and Palestinian olive farmers and other civilians. Palestinian Woman clutches what remains of her olive trees after Israeli forces destroyed her olive field. Olive Trees over Human Lives? The primary focus of this project is the destruction of olive trees by militarized Israeli government and settler forces. The loss of human lives and lands in Israel and Palestine cannot be ignored. This project is incomplete without mentioning the complexities of the conflict, as well as my own implicit bias. My research on the conflict has just begun, which is one reason for my focus on olives. I had heard of the uprooting of olive trees by Israeli forces and had interest in olives as a commodity. The importance of the olive trees is that for thousands of Palestinian olive farmers these trees mean life and a livelihood for their families. (Source) Destruction of olive trees as a means of obstructing the Palestinian olive market while also acquiring land. According to the United Nations Office of Humanitarian and Environmental affairs(UNOCHA), 7,500 olive trees were destroyed between January and October of 2012. That number rose with upsurges in violence in 2013 and 2014. According to Ahmed Najjar, a farmer and constuction worker as well as a father of six stated, “This year (2015)—with Israel and the Palestinian territories experiencing the worst violence they’ve seen in years” (Stuart). There are also incidents of cooperation in this conflict. Not every Israeli agrees with the destruction of Palestinian olive trees, and some are vehemently opposed. Despite the focus on the destruction of olive trees in this article, it is also important note that there are no homogeneous populations. The population of Israel, as well as the population of all of the West Bank, is made up of diverse heterogeneous populations. “In the Field with the Israeli Rabbis Protecting Palestinian Olive Farmers” is an article published on Vice written by Hunter Stuart. It details the incidents of violence that Ahmed Najjar and his family faced from Israeli settlers who lived near his olive farm. His trees were burned, along with a car near his property. Rabbi Arik Ascherman, the president of Rabbis for Human Rights (RHR), helped to organize a group of volunteers to provide an “observer force” or protective presence for families like Najjar’s while they harvest and cultivate their olives. RHR’s mission is to “inform the Israeli public about human rights violations,” and to pressure the Israeli government “to redress these injustices” (Stuart). During the six-week olive harvest the group of volunteer Rabbis travel around the West Bank, helping families they choose based on a variety of factors. Most of the families they visit and help out they have been in touch with for a long time, Asherman explains. Luckily, RHR is not the only organization like this helping to fight for the rights of Palestinian olive workers and provide a protective presence. JAI Palestine published an article about an organization launched in 2002, the Olive Tree campaign. Volunteers from all over the world work to “keep hope alive” by distributing olive saplings to farmers whose trees have been destroyed, providing protective presence and helping with the arduous labor that goes into cultivating and harvesting olives (JAI). Despite the many people working to uplift the olive farmers whose livelihoods have been destroyed, the devastating impacts are still evident. Farmers whose trees were destroyed two or three years ago still feel the effects because of the slow growth of the olive trees. For many farmers, the trees had been their livelihoods since childhood, selling and processing the olives from the same trees that their great-grandparents nurtured. Olive tree destruction was at an all time high in 2015. Since then, thousands of trees continue to be destroyed. The conflict is far from over, and farmers whose trees were destroyed will most likely never be able to restore their trees to the production level they were at before the attacks. The loss of the olive trees not only means the loss of those crops, but also the loss of crops for the next 20+ years. If a farmer is not able to pass on their knowledge to a younger person, that knowledge is lost. With more and more young Palestinians leaving the olive farms to work in non-agricultural jobs, the future of the Palestinian olive market is very uncertain. With organizations like the Olive Tree Campaign however, protections for olive workers and their trees are being created. Despite Israel’s ever expanding borders, the recent decline in violence against olive workers and trees is a sign of hope. Atyaf, Alwazir. (2002, November). Uprooting Olive Trees in Palestine. American University. Canaan Fair Trade. (2012). Canaan Fair Trade Organization, Canaan, Palestine. Chelala, Cesar. (2014, November 3). Palestinian Olive Trees: Destroying a Symbol of Life. Counterpunch. Corradin, Camilla. (2016, June 23). Israel: Water as a tool to dominate Palestinians. AlJazeera News. Fadil, Adrien. (2013, September). Palestine’s Budding Fair Trade Olive Oil Industry. Pulitzer Center. IMEMC News. (2016). Illegal Israeli Colonists Cut Palestinian Olive Trees In Bethlehem. International Middle East Media Center News. JAI, Palestine. (2012, November 7). The Uprooted, A Tale of Palestinian Olive Farmers, documentary. JAI Palestine. MIFTAH. (2012). Olive Trees – More Than Just a Tree in Palestine . The Palestinian Initiative for the Promotion of Global Dialogue and Democracy, MIFTAH. Shariz, Sheeffah. (2015, June 15). Israel is Uprooting West Bank’s future. The New Arab. Shiraz, Sheeffah. (2015, July 4). Why Do Zionists Hate Olive Trees?. The Palestine Project. Stuart, Hunter. (2015, October 21). In the Field with the Israeli Rabbis Protecting Palestinian Olive Farmers. Vice.